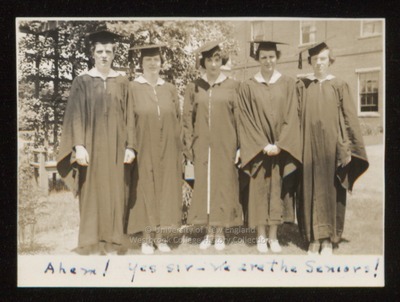 Five Westbrook Junior College graduates pose in their caps and gowns, on the campus Green, in this 1936 sepia toned candid snapshot. The girls, all with short hair, wear white shoes and white collars. Handwritten on the front of the photo in blue ink is: "Ahem! Yes sir - we are the Seniors!" On the back, also in blue ink, is written: Cole, Moore, Gross, Cunningham & Palmer '36."